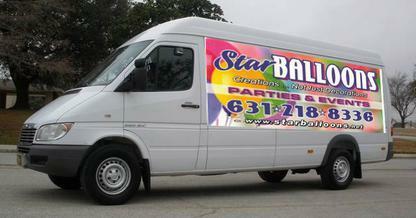 When you’re looking for the very best in balloon decorations, Star Balloons is the ultimate choice for balloon decor. We want to be your one stop shop for all things related to event and party decorations with balloons. You will see that we do private events which includes things such as weddings, birthday parties, baby showers, also Bar/Bat Mitzvah's, christenings, and retirement parties. This would include, picnics, sporting events and the like, Which would include different types of balloon decorations specifically more suitable for corporate venues and events. So whether you are looking to host a grand opening or just looking to tell your boss happy birthday, this is the place to look for your events. As we do proms every year, we figured that the schools should have their own category. 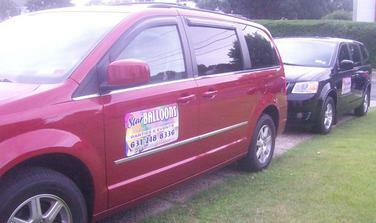 We also do dances, schools also have a great number of other events that work out great for balloon décor. Such as open houses, and fall festivals where balloon decorations can be a fantastic addition as well. We can fill all of your needs,including one of a kind centerpieces. 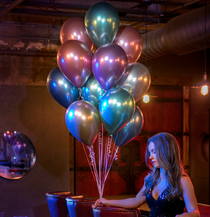 Whether you are having a birthday party, wedding, homecoming, prom, grand opening, or trade show we can help create one-of-a-kind balloon products specific to your needs that can fill your room with classy decor without breaking your budget. We are excited to announce that we are now offering the latest innovation in latex balloons....Chrome Balloons. Celebrate with sleek, metallic shine for a never-before-seen visual experience. Add extra glamour and shimmer at weddings, anniversaries, sweet 16's and many other occasions.